By using Finite Element Methods ( FEM ), optimal reinforce ribbings are directly cast into the bed and column structure. 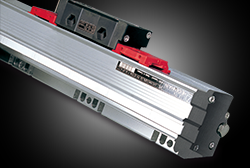 Mechanical rigidity has been increased by more than 30% when compared to conventional designs. The SUPER GV series is capable of performing super heavy-duty turning and maintain long-term super high-precision accuracy. The heavily ribbed, symmetric box-type designed bed, column and cross beam are of Meehanite casting. 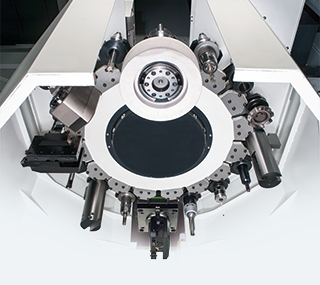 This high rigidity structure can effectively reduce thermal distortion while increasing heavy-duty cutting capability and maintaining machining accuracy. 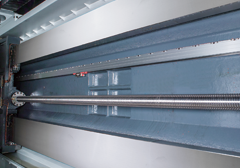 The moving cross rail structure is installed with a set of symmetric ball screws which is driven by servo motors to provide high precision and heavy load axial feed capability. The structure uses two sets of live locking bolts to support the cross beam. 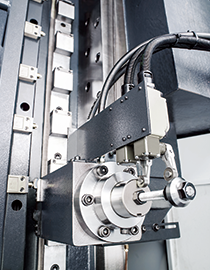 After precision positioning, the bolts will be locked by a hydraulic clamping force to ensure the overall rigidity. 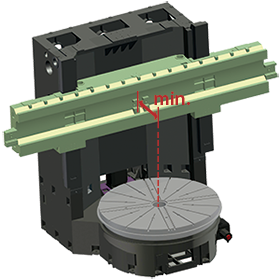 The space between each step of the positioning mechanism is 200 mm ( 7.87" ) which can easily fulfill various types of machining requirements. 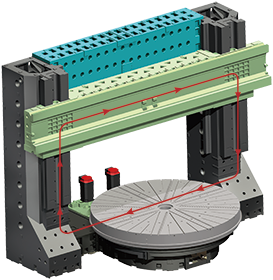 Standard 16-tool umbrella type magazine is designed with cam movement mechanism which provides bi-directional tool selection, low noise and accurate positioning advantages. The optional 24-tool umbrella type magazine provides ample amount of tools which can easily fulfill complex work-pieces machining applications.